James Anderson toppled Ravindra Jadeja to conquer the top ranked bowler's spot in ICC Test cricket rankings. He surpassed the 500-wicket mark and claimed 7 wickets in the second innings of the Lord's Test to help England defeat West Indies. 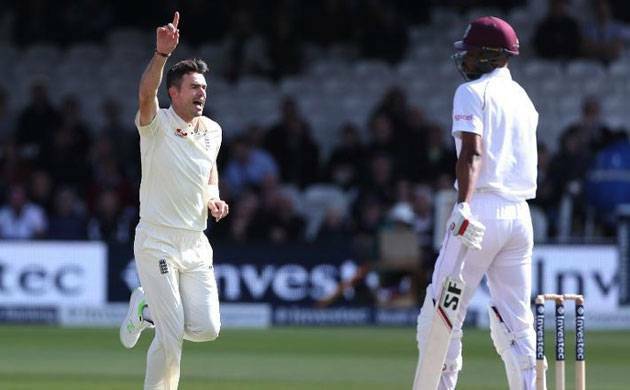 England’s leading fast bowler James Anderson replaced Indian left arm spinner to grab the top ranked bowler’s spot in the ICC Test rankings after his stupendous performance in the Lord’s Test against West Indies. Anderson crossed the 500 wicket landmark apart from claiming 9 wickets in the match to help his team beat the Windies and conquer the series 2-1. Further, he also picked a career best 7/42 in the second innings of the match to torment the West Indian batsmen. James Anderson has cemented his place among the greatest fast bowlers of all time after he became only the sixth bowler to claim 500 or more wickets in Test cricket. The Burnley Express is all set to go past Glen McGrath's haul of 563 Test scalps. Glenn Mcgrath and Courtney Walsh are the only two fast bowlers who are still ahead of Anderson. Apart from the pacers, three spin wizards, Anil Kumble, Shane Warne and Muttiah Muralitharan are ahead of him. Anderson, who was the top-ranked bowler in August 2016, has reclaimed the spot to become the oldest bowler to be number-one ranked since Sri Lanka spinner Muttiah Muralitharan in July 2009 and the oldest pace bowler to be at the top since Australia’s Glenn McGrath in January 2006.